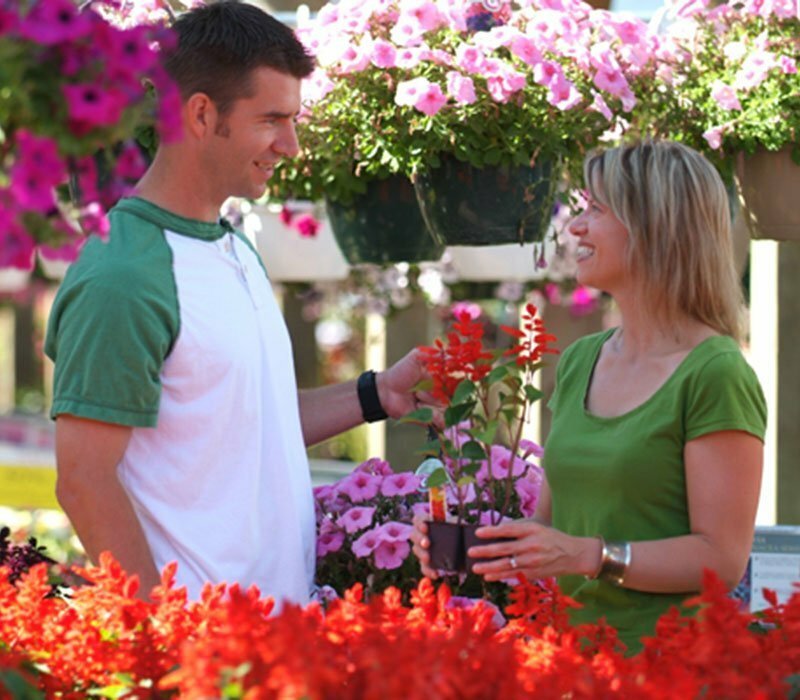 With the widest selection of annuals, perennials and nursery stock in the Twin Cities, Gertens is only one of a handful of garden centers that grows the majority of the goods we sell, making your entire experience unlike any other. We invite you to come and Discover the Wonder of Gertens today! Gertens' retail space is polished, colorful, fashionable and tidy, yet still down-to-earth and functional. "It's not about a shiny package, it's about performance," says Gino. "We really want to have genuine offerings that benefit the customer genuinely. It's not a fancy offering, it's a real offering." From the front door, customers walk in to a seasonal display; in April, it's a large selection of grills, including the Big Green Egg and high-end Weber models. By late Autumn, Christmas dominates that space, including live and artificial trees, greens, lighting, garland and holiday home decor. Grills have been a surprisingly good category during the recession, says Gino. Customers justify the expense because they are saving by cooking at home. To the right begins a display of annual plants and full spring color: hanging baskets and premium annuals like tuberous begonias, geraniums, gerbera daisies, New Guinea impatiens and double impatiens. Outside, at peak, annual flowers and vegetables fill table after table. Inside, Gertens' Birds Nest area consists of 40 linear feet of feeders, with sections devoted to hummingbirds, bluebirds and wood ducks. Pallets hold stacked bags of birdseed, including black sunflower seed, premium wild bird seed and cardinal feed. Pottery is displayed inside and out. "Pots, to us, are fashion," says Gino. "Every year it changes, and we want something different." Gertens does a lot of direct-importing of its pottery. The styles are stunning - from traditional Italian terra-cotta to blue-glazed, to crescent-shaped planters and lightweight resins in dozens of shapes and colors, including a fire engine orange-red. Outside, there is a design center where customers can work with designers "a la carte" for as little or as much help as they need, a classroom space for April seminars and a custom potting area. Back inside, Gertens is on top of the grow-your-own trend with 80 linear feet devoted to seeds, 12 rows deep, and starter plants like seed potatoes, onion sets, saplings of fruit trees and small blueberry bushes. The section includes canning supplies, mortars and pestles, kitchen compost containers and even Mantis tillers. Nearby is a gardener-focused gift shop with T-shirts (including one that reads, "Will Garden for Food"), gift books, stuffed animals, jewelry and Vera Bradley bags. The section devoted to lawn care, turf and grass seed mixes is an area near and dear to Gino, who says, "Turf was always my thing." He explains, "We're very parochial about lawn and garden. We're orthodox about it. If you have fire blight, we'll make sure you have streptomycin. If you have a shady spot where you can't get grass to grow, we'll make sure that the fescues and the bluegrass, the shade-tolerants, are in the mix so it will work under your shade tree. We don't give you generalities, we give you very specific things to help you out. We're very precise, and we're kind of old school when it comes to making sure you get the right stuff. We don't compromise." That philosophy is clear in a line of boutique grass seed blends, all sold in plastic self-serve bins as if they were gourmet coffee beans as well as in 5-, 10- and 25-pound bags. There are mixes for dense shade, sun and shade and sandy soil. Among the dozens of varieties is a "Wear and Tear" mix to take the stomping feet of kids and dogs; "Soft Drink," which doesn't need a lot of water; and a "Deer Mix" that includes seed for deer goodies like clover, sugar beets and parsnip. JRK, a separate company owned by Gino, makes the grass seed mixes and also sells to area garden centers. It's an example of Gertens' expertise. "We can't always communicate that in a mass market way, but if you come in looking for help, we have the right stuff. We want to know what you really are looking for to make sure you get the right thing," says Gino. The lawn section also includes fertilizers, amendments, spreaders and weed killers. And there is an extensive selection of watering equipment, garden gloves and tools. "We can't show enough gloves or garden trowels," says Gino. "Women buy them. They're never sure how many pairs of gloves they have, so every time they come to the garden center, they buy a pair. I don't want to disappoint them." Back outside, near the lots of perennials (of which Gertens grows about 700 to 800 varieties), shrubs and trees are demonstration patio and landscaping projects like outdoor pizza ovens and samples of all the material in the landscape supply yard. Fire pits and patio furniture are also merchandised here. Like grills, demand has been strong, Gino says, because people are staying home.